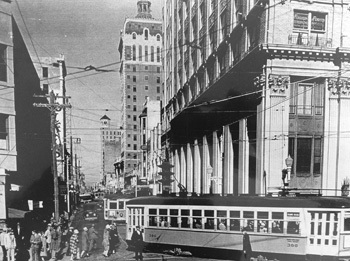 Downtown Miami, 1933: In right foreground is the First National Bank of Miami, painstakingly restored as today’s Flagler First Condominiums. Romer Collection, Miami-Dade Public Library. As I traipsed around an ever-changing downtown Miami last month, I wondered about its beautiful stock of early 20th-century buildings. So this month I met up with Ricardo Lopez, an architect and urbanist with the firm Florez Lopez Architects. A native Miamian, he specializes in custom residential architecture and urban design, and teaches at the University of Miami’s School of Architecture. We sat in his office inside the historic 1920s Huntington Building -- also known as the Consolidated Bank Building -- on SE 1st Street, thumbed through archival photos, and discussed the history of Miami and the future of its urban core. “Downtown Miami used to be Key West on steroids,” he said. In the days when it was nothing more than Henry Flagler’s pioneer village of boaters and adventurers, industrialists and outlaws, what is now downtown was indeed an untamed jumble of wooden houses and boatyards. This was an era when daily life took people only as far as their feet could carry them, and commercial and residential structures evolved on a focused grid. Only later, when urban development sprawled outward -- in Miami’s case, father into the Everglades -- did “downtown” come to connote a high-rise commercial center to which one commuted. This sprawl would eventually hurt downtown real estate values, even for in-demand, high-tech buildings like the steel-framed Huntington. Historic preservation is still a relatively new concept in America. European countries, for example, have reused buildings for centuries. Yet even here, in the capital of all things new, preservation is gaining value, from South Beach’s Art Deco District to the MiMo District in Miami’s Upper Eastside. Depression-era masterpieces like the DuPont and Ingraham buildings still stand, but Miami has lost some gems along the way. Among them: the city’s main library in Bayfront Park and, more recently, the Urmey Hotel. Once the oldest building in Miami, the Urmey fell into disrepair before being razed to make way for Loft 4, an unrealized downtown condo project from The Related Group. A decade ago, financing flowed like champagne; local government embraced developers with tax incentives, public land deals, and lenient zoning; and a mind-boggling condo boom ensued. Developers could scoop up old buildings, knock them down, and build three times as high. Few of them saw value in renovating and reusing. The market asked for new construction, so local government aided and abetted. In the face of vanishing history, federal incentives such as tax credits and special financing have stepped in to make restoration a more competitive option. Even with South Florida’s limited supply of trained craftsmen, and the costs and surprises often involved, Lopez believes renovation is a worthy economic and cultural investment. From his window, he pointed to two standout historic projects. Flagler First Condominiums, on E. Flagler between the Seybold Building and the Gusman Center (the last downtown theater still standing), was developed by Rok Enterprises. They painstakingly restored the 1923 structure to its former glory, breathing life back into the Corinthian columns from its days as the First National Bank of Miami. Capitol Lofts, on NE 1st Avenue, is another high-quality renovation. Lopez guessed that if the developers had opted for tear-down and new construction, they could have built the project four times over -- and “to the moon,” thanks to no height limits or density restrictions. He also spoke excitedly about the Shoreland Arcade on NE 1st Street, the only remaining historic arcade in downtown and a site close to Lopez’s heart. He had his class at UM document the building and submit drawings to the Library of Congress for the Historic American Building Survey. The Arcade’s gilded, cavernous hallway, tucked behind the subdued interiors of Soya & Pomodoro restaurant, was also the site of his wedding reception. Lopez remains unequivocal in his view of urban development: “American cities suffered through 50 years of Modernism, a cancer that destroyed traditional urban centers. There was a cultural backlash against all things traditional, but that’s now changing.” Solid materials have allowed Depression-era buildings to live long enough for our romance with them to rekindle. Like a lot of buildings from the last half of the 20th century, the products of our condo boom seem so transitory in both their usefulness and appeal that the public’s relationship to them in 100 years will be uncertain. If Lopez is right, those buildings left standing could become dated relics from a period of overarching hubris, when short-term gains blinded our vision for the future of Miami’s urban center. For his part, Lopez is going to keep reminding us that it is possible to build on the past without burying it.